The Racing division was created in 1986 and initially raced very successfully in the FF2000 1987 where they achieved three wins and two lap records. 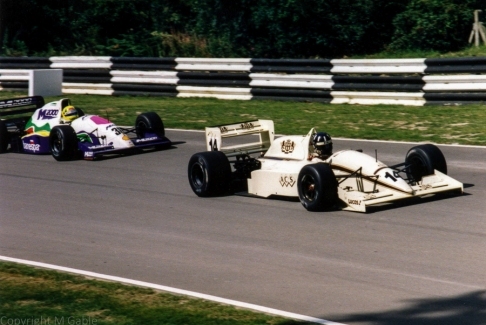 1988-89 Middlebridge moved up into Formula 3 and the team drivers were John Alcorn (won at Brands Hatch) Phil Andrews and Arnoud Guiot for a few drives. The team maintained a reasonable positions during 1989 running Reynard 89Ds with McLaren, Cosworth DFV engines, Phil Andrews continued to drive but alongside him now is Mark Blundell, who I'm sure needs no introduction. 1990 The team are looking to have Phil Andrews driving in F3000 using an all new engine developed by Tickford, Middlebridge also paid £1 million to Bernie Ecclestone and gained control of Brabham for the 1990 Formula 1 season, they borrowed the money from Landhurst leasing and struggled with the repayments, the team managed to score a few points and the drivers were, David Brabham and Damon Hill son of Graham. These very rare Middlebridge Racing Pictures (below) were very kindly given to me by Dennis Nursey and are pictures that he himself took during his reign as CEO of Middlebridge Racing and Middlebridge Scimitar. The pictures are all numbered and soon we hope to add descriptions of the content. Many thanks to Dennis for the pictures. I'm sure many people will enjoy looking back. Pictures above courtesy of Dennis Nursey, Many thanks Dennis. The second photo was from the International F3000 Championship 1991 - Brands Hatch: Damon Hill (leading Christian Fittipaldi) - Lola T91/50 - Jordan Racing. Finished 6th. Turning into Hawthorns. 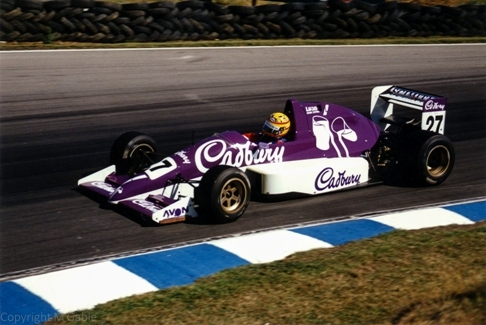 1989 Birmingham Superprix with Mark Blundell driving the Middlebridge Reynard in Cadburys colours and finishing 5th. Thank you to Will Anderson for forwarding this link. Brabham Racing was founded by Jack Brabham and Ron Tauranac, they both worked in Australia, Jack being the more well known of the pair, and Ron doing design work during the 1960s, Brabham was the worlds largest builder of open wheel racing cars and won four drivers and constructors championships during its 30 year F1 history, Brabham also had cars competing in Formula Two, Formula Three and the Indianapolis 500, Bernie Ecclestone owned Brabham during the 1970s and 1980s before selling to Middlebridge prior to him becoming responsible for the administrating the commercial aspects of Formula One. Some well known names connected with Brabham. Founders; Jack Brabham, Ron Tauranac. Staff; Bernie Ecclestone, Gordon Murray, Ron Dennis, Charlie Whiting and John Judd. Drivers; Jack Brabham, Dan Gurney, Damon Hill, Graham Hill, Denny Hulme, Niki Lauda and Nelson Piquet. Middlebridge (VAG - BMW) Yes another finger in another pie. Middlebridge already had close connections with the VAG of companies and used many components in the Middlebridge version of the new Scimitar. Back in 1987 BMW produced what is claimed to be the most successful racing / touring car of its type - the M3. During its 5-year reign it achieved 1436 notable victories and continued to do so after 1992, winning races in the Group A's events in Europe, Japan and Australia. In all 260 cars were produced in Touring Car trim, which could race in Group A, DTM and Group N, with an additional 40 - 50 rally cars swelling the numbers. They were built for the express purpose of winning the European Touring Car Championship (ETTC), but were rushed into production to challenge for the World Touring Car Championship (WTTC). In the first race at Monza in 1987, M3's filled the first 6 places but were disqualified for running what is known as 'cheater panels'. The success made everyone sit up and take notice especially the Ford Motor Company who were campaigning some savage RS500 Sierras and were determined to win the WTCC. The racing was close all season and battles were order of the day right down to the last race with the Schnitzer M3's of Charlie Lamm, just beating Ruedi Eggenberger's Texaco Sierra, BMW only just taking the title. BMW were still considered the underdog and they were aware that they needed to do something extra special if they were going to keep in front of Ford's RS500 Sierra, hence the 'Evo' (evolution) label was added to the M3's various improvements. These included more grunt from the engine, better aerodynamics, lighter body panels and more amenable driving positions. The ultimate Evo package was achieved in 1990 for Group A cars, (but not DTM), and at that time Australia had created their own Group A, as had DTM. Japan, however, stayed faithful to the original Group A concept and followed FISA (FIA) rules for racing. The reason why is not too clear and could have been for many and varied reasons, after all Nissan (for one), had spent an absolute fortune developing the R32 GTR which dominated Group A. Whatever the reason, the 'golden age' of Japanese racing saw tracks filled with BMW, Ford, Honda, Mazda, Mitsubishi, Nissan, Toyota plus the occasional Mercedes 190E joining in the fun. The car was painted in Valvoline's corporate colours and had all the latest Evo gizmos. In that very smart guise, Anthony achieved many podium places, including a win in round 5 of the JTCC at the Ti Circuit Aida. At the 1993 season's end, Reid was in second place behind the Auto Tech M3!